There are few who doubt that, after finishing up his sixth season in Major League Baseball, Jason Heyward is a good player. Up for debate is precisely how good Jason Heyward has been during his career, and more importantly for whichever teams signs him this winter, how good Heyward will be moving forward. Attempting to measure defense with advanced statistics like UZR and DRS has its critics, and attempting to place a value on it can be difficult. Heyward has been an above average offensive player, incredible on defense, and heading into free agency a few months after turning 26 years old, provides few realistic players for comparison. Heyward will get paid. How much will he be worth? Heyward’s main drawback, perhaps only drawback, as a player seeking more than $100 million is his lack of power. He hit 27 home runs in 2012, but recorded just 13 of them this year along with an isolated slugging percentage of .146, essentially league average. Combining average power with a low strikeout rate (14.8% in 2015) and a solid walk rate (9.2%), Heyward’s wRC+ of 121 puts him in the upper third in terms of the league’s hitters. Adding in 23 steals on 26 attempts and the rest of his baserunning, Heyward’s 22 runs above average on offense placed him within the top quarter of qualified hitters. Lacking in top shelf power, Heyward still provided solid numbers on offense, and after a disappointing start with he Cardinals, he hit .306/.375/.455 with a wRC+ of 130 from the beginning of May to the end of the season. 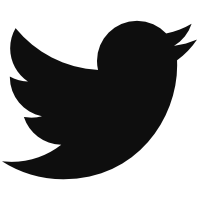 The lack of power does prevent easy comparison to most free agent mega-deals. The names brought up most recently with regard to Heyward are Jacoby Ellsbury, who got seven years and $153 million from the New York Yankees two years ago, and Carl Crawford, who received seven years and $142 million from the Boston Red Sox five years ago. While those deals might no look great now, age is a major factor. When Ellsbury was Heyward’s age, he had just completed his second full season. Crawford debuted young, but due to a team-friendly contract, he did not become a free agent until after his age-28 season, three years older than Heyward. Ellsbury, now 32, has been worth 21 wins since turning 26 while Crawford, 34, has been worth 22 wins over the last eight seasons. Solid production, that, despite some disappointing seasons mixed in. Limiting Heyward comps solely to free agents leaves little by way of realistic comparison. Earlier this week, August Fagerstrom took a look at recent seasons authored first of Mike Trout and then of Clayton Kershaw and compared them to the greatest peaks of all time. Heyward is not Trout-level amazing, but he has been incredibly productive through his age-25 season. Using a similar exercise, I found only 28 players with at least 25 fWAR and bWAR (FanGraphs WAR and Baseball Reference WAR, respectively) since the end of World War II. Their average WAR is below. I am obligated to mention that Mike Trout still has two more seasons to add to his totals. Heyward’s production, meanwhile, has been excellent from an early age, similar to multiple Hall of Famers. What follows is an attempt to find similar players to Heyward using various methods: WAR, offense, defense, and a hybrid of offense and defense. For the first method, we assume the only information we know is age, WAR, and total number of plate appearances. To isolate players similar to Heyward, I looked for players from 1960 to 2007 within five of Heyward’s 27.8 WAR and within 20% of his 3429 plate appearances. I then looked at age-25 performance and eliminated anyone who was not within two wins of Heyward’s six-win season this year. The last qualifier hurt more than helped Heyward, as Barry Bonds and Adrian Beltre were removed from the list. These were the players remaining. Heyward was a little below the average offensively and well above the average defensively. As in the case of the first table, we again see some of the greatest baseball players. When signing long-term contracts, teams tend to pay them out equally over the length of the contract. As teams expect to get the best production at the beginning of the contract, they understand that a contract will likely underpay the player in the early years and potentially overpay him as he ages — with the surplus from the beginning ideally canceling out the loss at the end. The most important years are likely to be those at the beginning, in which the team hopes to underpay their player. Using the players from the chart above, here is how those players played from age 26 through age 30, the first five years of a potential Jason Heyward contract. This production is, quite frankly, incredible. Over 55 combined seasons, the group averaged five wins per season. That level of production would justify a $200 million contract based on the first five years alone. The lowest member of the group, Willie Randolph, still averaged more than three wins per season. This group also aged incredibly well. Here are their total numbers from age 26 through age 35, a total of ten seasons per player. Out of 11 players, only Jim Fregosi’s production would not have justified a $200 million contract. Every other player produced at an incredibly high level from age 26 to age 35, maintaining their hitting line from 26 to 35 that they had in their early 20s. 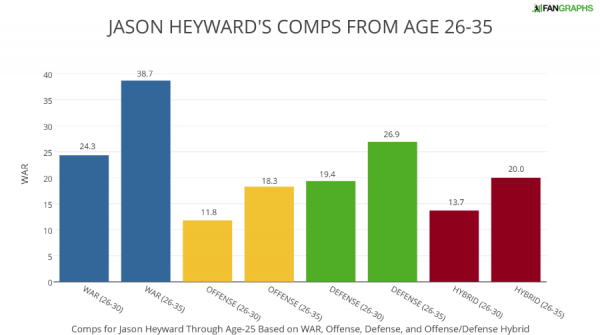 The above comparison paints an incredibly optimistic and rosy view of Heyward’s future, but there is some evidence to suggest that phenoms like Heyward age better than the rest of the population. While Heyward is a solid offensive player, he does get a decent portion of his value from defense, which causes some concern about how Heyward’s value will sustain itself as he ages. The next group of comps considers only offensive production. If we pretend we know nothing about Heyward’s defense, we can come up with a set of comps based solely on his hitting, even removing his value on the basepaths. Searching again for players from 1960 to 2007, limiting those players through age-25 within 20% of Heyward’s PAs, but instead of using WAR, look at players with a wRC+ between 110 and 125 and within 15 points of Heyward’s 121 wRC+ at age 25. That search reveals the following players. These comparable players here are not quite as accomplished as those from the WAR group above, which is to be expected given defense is not taken into account. Heyward is actually the most accomplished offensive player in the group due to being worth more than 20 runs above average on the bases, but strictly as a hitter, these are the players with similar profiles. Here is how they performed over their next ten seasons. Going solely by offense, this group has a total bust rate of one in three. Tony Conigliaro was unfortunately never the same after a pitch permanently injured him, while other players like Ruben Sierra and Carlos Baerga simply did not produce despite opportunities. The group also has five players at the top who were tremendous successes. Overall, the group still put up above average numbers offensively. Averaging out to a league average player for a total of ten years is a decent feat. The general concern around Heyward and defense is twofold. First, there are questions as to whether Heyward is actually worth as much as the defensive metrics say he is. Second, if Heyward’s defense declines he ages, he is not likely to be of much value. As to the first, this is not the article to convince someone about advanced defensive metrics, but his highlight-reel catches, mutiple Gold Gloves and three Fielding Bible awards seem to indicate there is some consensus from all viewpoints on the excellence of Heyward as a fielder. Regarding the second concern, I attempted to isolate only very good fielding outfielders. I looked for outfielders from 1960 to 2007 who produced defensive runs above average (which includes the positional adjustment) within 20 runs of Heyward’s 61.9 runs above average mark. I looked through age 25, but lacking enough comps, expanded the age range to 26 years old. As was the case with the offensive player-comps group, Heyward is more accomplished than almost all of the players on this list. Looking solely at defense, these are the types of players who compare with Heyward. As expected, their value on defense drops over the next ten years, but a curious thing has happened to their offensive numbers simultaneously. From 26 to 35, the group got better offensively and the only player who completely busted was Carey Patterson. Mark Kotsay did not do well overall, but he was actually averaging around three wins per season from 26 to 30 before having a negative value as his career wound down. The group as a whole averaged nearly four wins per season from age 26 through age 30, which would be a very good result for Jason Heyward. If he took the same type of offensive step forward as Carlos Beltran and Reggie Smith, he might win an MVP. There are not enough players here to draw conclusions, but it might be worth looking into whether good, young defensive players age better overall as hitters. Jeff Zimmerman found that speedy players, like Heyward, age better than the rest of the baseball population. Good defensive outfielders might simply be a smaller subset of that group overall. Ideally, we could look for players like Jason Heyward who are good offensively and defensively and see how those players performed. Unfortunately, for studying purposes anyway, there simply are not enough of those types of players to look at. Since the end of World War II, there are 42 players to have produced more than Heyward’s 61.9 defensive runs above average through age-25, and there are 61 players responsible for more offensive runs above average than Heyward’s 94.5 through his age-25 season. There are only four players ahead of him on both offense and defense: Evan Longoria, Johnny Bench, Barry Bonds, and Cal Ripken. Dropping down Heyward’s offense by 20 runs still yields no other results. Only Al Kaline, Willie Mays, Ken Griffey, Jr., and Alex Rodriguez were within 15 runs on defense and ahead of him on offense. However, if we want some sort of hybrid, we can look at the declines of the offensive comps and the defensive comps and combine them. Taking the runs above average on offense from the offensive group and the runs above average from the defensive group, adding in the value of a replacement player by averaging the plate appearances from the two groups and then using ten runs per win, we can get an approximate value. This figure is not a conclusory number or necessarily the best way for projections, but simply another method in the attempt to find a likely value for Jason Heyward. 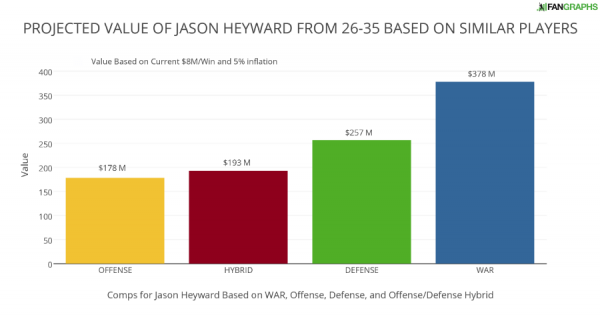 The chart below shows the varying WAR averages from above for Jason Heyward comps at age-26 through age-30, as well as 26-35. Looking at the numbers from 26 to 30 in each group, it is understandable why Heyward’s agents would seek an opt-out clause within the first five years. No matter which group you look at, he is likely to be a productive player at age 30. The WAR group, which constitutes the group most closely approximating the quality of the player Jason Heyward is currently, puts Heyward on a Hall of Fame track. The other groups, with players similar to some aspect of Heyward’s game, but inferior in other ways, make Heyward a high-quality player, one perhaps worthy of a $200 million contract, but not a Hall of Famer. Putting everything together, we still have not placed a value on those wins. There are two graphs below estimating the value of Heyward’s comps over the next ten years. I used ten-year figures in this analysis, but moving to an eight- or nine-year contract would not significantly change the values, as the bulk of all production is recorded in the early part of the contract. Teams should, and likely do, look at adding years to a contract as spreading out money over a longer time period rather than seeking an extra year of value. FanGraphs currently estimates the cost of a win at around $8 million. The first graph is conservative, beginning the estimation of a cost of a win at $7 million with inflation set at five percent per year (although salaries have been rising at a rate greater than that amount in recent seasons and are up about 50% from half a dozen seasons ago). For my ease, I took five-year averages for both WAR and the cost of a win when calculating the total. While the $330 million figure is likely the one that jumps out, I would direct your attention to the smallest number: $159 million. When we know nothing else about Jason Heyward except the way he hits — singles, doubles, triples, home runs and walks — without regard for his offensive contributions on the basepaths or his defense, his comps would be worth $159 million. Age is the decisive factor here. Jacoby Ellsbury just finished Year Two of his contract. When Heyward is Ellsbury’s age, he will have just finished Year Six, or might have already opted out for another big contract. Using FanGraphs’ approximate current cost of a win at $8 million, the numbers are even bigger. 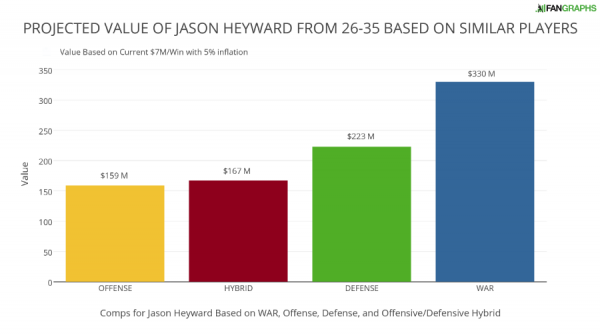 The numbers may seem outrageous, but MLB revenues have been rising at very high rates, and there is so rarely a player of Heyward’s caliber and age that the market will likely have a difficult time finding a consensus. Heyward’s defense and lack of power has the potential to confound, but stripping away the defense, we still see an incredibly valuable player with the potential to maintain or even improve his production. FanGraphs crowdsourcing puts Heyward’s predicted contract at eight years and $184 million while Dave Cameron predicted a return to the Cardinals on a nine-year, $195 million contract with an opt-out after four years, making the value of the contract in excess of $200 million. Injuries happen and players decline unexpectedly. Jason Heyward is not immune from those forces, but based on what he has done so far, his future could provide his employer with significant value on one of the biggest contracts in MLB history. We hoped you liked reading Trying to Put a Value on Jason Heyward in Free Agency by Craig Edwards! I was just saying the other day that there hasn’t been a free agent who’s so valuable in this particular way–a combination of very good performance and youth–since A-Rod in 2000. Obviously, Heyward is nowhere near as good as Rodriguez was then, but the argument for blowing the budget to sign him is a similar one. If you can sign him without an opt-out, you might be in the rare position of having an 8- or 10-year megadeal where the player is worth his salary every year. With all this hype I’m still trying to figure out why the Braves basically gave this guy away?? Shelby Miller is a good young pitcher, but straight up for Heyward? Contracts matter – Miller is entering his first year of arbitration while Heyward is now a FA.